Once you know how to make hummingbird food, you'll just need a few hummingbird feeders and soon your garden will be filled with these delightful little birds. The first hummingbird feeder was made available to the public around 1950. This feeder was made of hand blown glass and relied on homemade hummingbird nectar to attract the birds. As the hummingbird feeders evolved, the glass was replaced with plastic and bright colors were used to attract the hummingbirds. 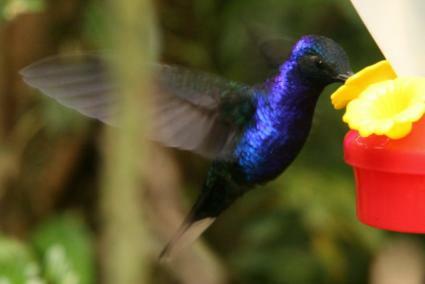 This proved more efficient because hummingbirds are attracted to color rather than scent. Ease of assembly: how easy is the feeder to take apart and put back together. Ease of cleaning: you will be cleaning the feeder every four days, so a feeder that is easy to clean is important. Hummingbird feeders come in two basic forms: the basin feeder and the inverted bottle feeder. The basin type is usually easier to clean and so is very popular. Other than nectar, hummingbirds like to eat small insects like fruit flies and spiders. Some people like to hang an old banana skin near or above the feeder to attract fruit flies. An old orange or an apple will work just as well. If you are not too keen about having old rotting fruit hanging around your garden, you can just stick with the feeder and the homemade hummingbird nectar. Hummingbird food is a very basic recipe similar to simple syrup. You may be tempted to use turbinado sugar or brown sugar, but this is never a good sugar to use. These sugars contain too much iron for the hummingbird's system and can cause illness or death. Powdered or confectioners sugar should not be used either. Powdered sugar has cornstarch added to it to prevent clumping and the cornstarch will cause the nectar to ferment. Bring the water to a boil and then add the sugar. Stir the mixture until the sugar has dissolved. Let the mixture boil for a few minutes. If the hummingbirds do not come to the feeder within a few days, you can try moving it to another location near plants that have brightly colored flowers. It may take a while for the birds to notice the feeder. Hummingbirds do not like change, so if you find a feeder that they like use that style of feeder. If you notice that ants have discovered your feeder, coat the wire from which the feeder hangs with petroleum jelly. This will keep the ants out of the nectar. How to Grow Asparagus By Stephanie Suesan Smith, Ph.D.